these clients on the benefits of home staging. After: This property sold within 2 days. As a knowledgeable professional, your clients expect information from you on how they can get the best return on investment from their property. 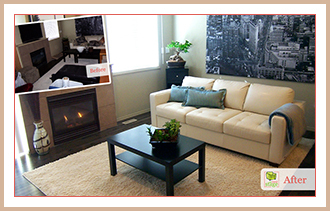 You’ve probably already done your research and know the benefits of home staging. Did you know staging is listed on HomeGain’s Home Sale Maximizer Guide as one of the top five home improvements for sellers (196% ROI) and yet only 76% of agents recommend? Learn the techniques of professional home stagers in-class and gain practical experience at a listed property. Discover the steps to preparing your client’s properties for sale, whether lived-in or vacant and recognize when a professional home stager’s help is required. For more information on CREB Education’s The Basics of Home Staging for Realtors®, contact Jen or contact CREB Education directly via email education@creb.ca or phone 403-781-1302 today.